Publius Cincius Slavius, whose name appears on the base of the sculpture, built the Pine Cone statue that now resides in the Court of the Pine Cone (Cortile della Pigna) in the Vatican, in the 1st century AD. The piece was originally a fountain that resided in the Temple of Isis in Campo Martius next to the Pantheon. The site of the Temple of Isis is now occupied by the Biblioteca Casanatense but the area is still to this day called Pigna. The fountain is described as having water gushing from the holes in the scales of the cone similar to the Meta Sudans (the sweating rock that was also topped by a pine cone according to some) that still stands outside the Coliseum. The Pine Cone was then moved to the hall of St Peter’s Basilica in the 8th century in the time of Popes John VI, John VII or Zachary (Pope Zachary seems the most likely as he did more than the other two to “Christianize” Rome by building churches over the old Roman temples). 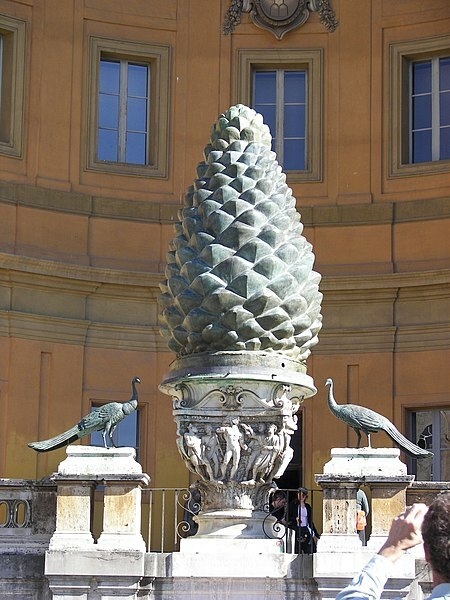 One of them moved the Pine Cone from the Temple of Isis to St Peter’s Basilica (the original built by Constantine the Great) where it was covered by a baldachin (it is recreated in this state in the game Assassin’s Creed: Brotherhood where it houses a Piece of Eden). In 1608, when St Peters was being enlarged to its present form the Pine Cone was moved to its current location by Pope Paul V.
The pine cone carries a heavy symbolism in Christianity supposedly being the fruit of the tree of knowledge in the Garden of Eden (hence the Assassin’s Creed link). It represents eternal life and enlightenment and the literal biblical translation is “the face of God”. The pineal gland in the brain (named for its similar shape) is the geometric centre of the brain and is considered the third eye or the seat of the soul. The Pope’s staff features a pine cone symbolising the illumination of the church. The symbolism of the pine cone is similar in many religions and was obviously absorbed by the Christians like many other aspects of the Greco-Roman and Egyptian religions. The fact that it stood in the Temple of Isis (a goddess revered by the early Christians as the Virgin Mary and often used as a disguise in the days of persecution) explains the reason behind the reverence of this sculpture. 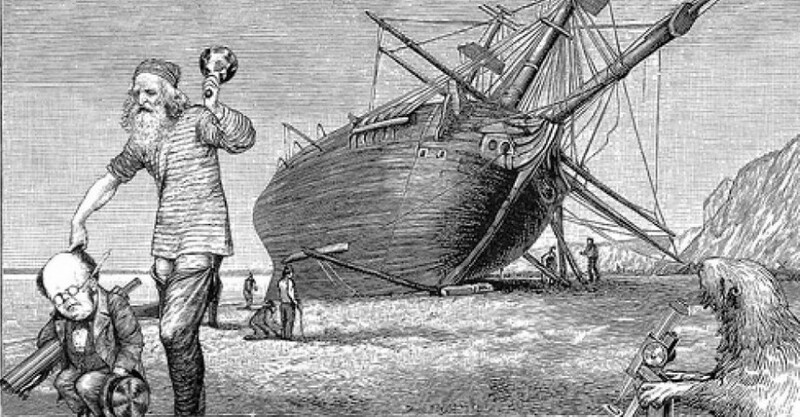 The peacocks at the base of the Pine Cone are the Christian symbol of eternal life stemming from the legend that their flesh did not decay (St Augustine believed that peacock flesh had anti-septic qualities). This, added to the symbolism of the shedding of the feathers and replacing them with brighter ones, alludes to the resurrection of Christ. The eyes on the tail feathers were also seen as the all-seeing eyes of God. This of course all comes from earlier Greco-Roman religions and was adopted when Christianity became the state religion of the Roman Empire. Both the pine cone and the peacock were synonymous with the Roman god Sol Invictus (the unconquerable sun) who was used as a substitute for the Christian God by Constantine on his coins who sought to keep both the Christians and pagans happy by using a symbol that was appropriate to both sections of society. The Christian day of rest was even placed on the day of Sol Invictus, Sun-day. The bronze peacocks, however, were not part of the original sculpture but are thought to be originally taken from Hadrian’s mausoleum (now Rome’s fortress, the Castel St. Angelo). Thus as a whole the Pine Cone is meant to be a symbolic fountain of life. Even in its present form the symbolism still points to the Pine Cone as an emblem of renewal in the Eternal City. 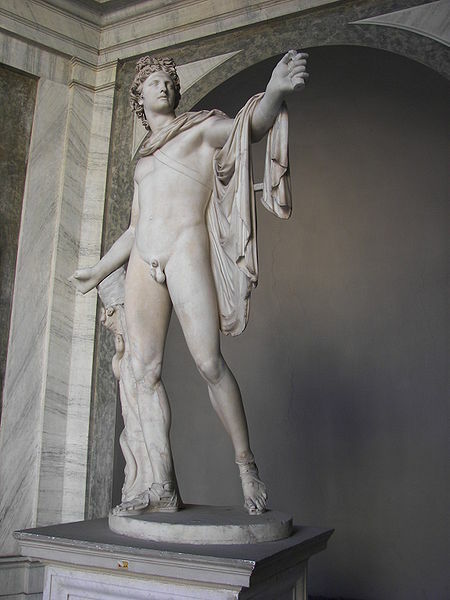 The Apollo Belvedere is thought to be from the reign of Emperor Hadrian (120-140 AD). It is thought to be a copy of a lost bronze statue by the Greek sculptor Leochares from around the 4th century BC. It is widely suspected to be a Pythian Apollo with is Apollo killing Python, the serpent that guarded Delphi. Another thought is that it could be Apollo killing Tityos who had threatened his mother Leto. It was rediscovered in the 15th century in the personal collection of Cardinal Guiliano della Rovere who became Pope Julius II. Della Rovere fell foul of his predecessor Pope Alexander VI, the last Borgia Pope, and had to leave Rome for the duration of Alexander’s papacy. During this time the Apollo stood in della Rovere’s personal garden at SS. Apostoli. After the death of Alexander, Cardinal della Rovere was elected Pope. Now known as Julius II he moved the Apollo to the Cortile del Belvedere. During this time several copies of it were made. Pier Jacopo Alari Bonacolosi made a wax model of it, which he then cast in bronze and partially gilded to feature in the Gonzaga collection. Both the Pine Cone and the Apollo Belvedere are incredibly important cultural objects (two among many held in the Vatican) that have largely been forgotten despite millions of tourists passing them by every year. the pine cone is ,a symbol of a basic theme of nature the spiral. the universe is a spiral, our own lives repeat themes, our dna is a spiral. The pinecone represents us, our nature. Nice article. I was wondering about the pinecone at the end of Assassin’s Creed Brotherhood. Then, watching the TV show “Borgia,” I saw it during a Vatican scene. I figured it must have been moved. I have to laugh at it being cast in the role of the “forbidden fruit” — how’d you like to chomp into a pinecone? So much of Christianity is taken from Paganism, though many hate to admit it. I don’t think that there are many who would deny the Pagan past. Members of the church who I have spoken to have all seemed very proud of Christianity’s ability to absorb local traditions.